The Morning Room occupies the south end of Blore’s wing, but was remodelled by Schomberg Scott. 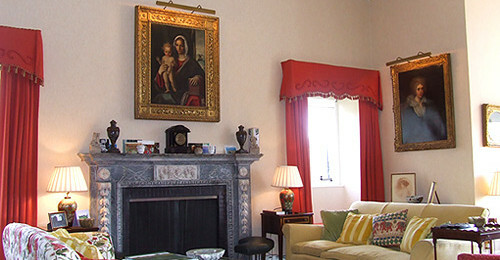 There is a handsome Georgian marble chimneypiece over which hangs an Italian Fifteenth Century Madonna and Child attributed to Bellini. Other paintings of interest in the room are two more of the Wootton classical landscapes in good Eighteenth Century frames, a pair of Scottish landscapes by Nasmyth, recently acquired, and two small Dutch landscapes by Ruysdael and Ostade, respectively. On either side of the big window are striking portraits by Sir Thomas Lawrence of John the 7th Marquis and his mother Henrietta, the 6th Marchioness. It was the 7th Marquis who commissioned Blore to rebuild this part of Monteviot. Before inheriting the title, he sat in the Commons as MP for Huntingdon in Lord Liverpool’s government. He suffered from ill health and died aged only 47, which is why Blore’s designs for Monteviot were not completed. Of his four sons, two, William and Schomberg, succeeded as 8th and 9th Marquises successively; the third, Ralph was the father of the 11th Marquis and the youngest, Walter, the grandfather of the 12th Marquis of Lothian. The setting – overlooking the River Teviot! Trees, shrubs and wildlife on the river. Friendly man in the ticket shed. All round great place.